According to the Joint Plant Committee (a unit set up by the Indian Ministry of Steel), in fiscal year 2013-2014 (in India the financial year runs from 1 April to 31 March) India’s steel production increased 7.9% year-on-year, to 88.12 million tonnes. The integrated steel plants (SAIL, RINL, TSL, Essar Steel, JSW Steel and JSPL) together produced 45.3 million tonnes in fiscal year 2014- 2015 (up 2.4%) while other producers accounted for 42.8 million tonnes (up 14.3%). Real consumption of steel increased 3.1%, to 76.3 million tonnes. Despite the increase in steel output, imports surged 71% to a record 9.32 million tonnes, with India becoming a net importer of total finished steel. India’s steel imports increased further in Q2 of 2015, by more than 53%, indicating that domestic producers continue to face pressure from cheap inbound shipments, mainly from China, Japan and South Korea. This has brought down capacity utilisation levels of domestic producers to about 80% and has eaten into the market share of established Indian companies, putting pressure on the balance sheets of hundreds of Indian steel companies. In order to stem rising imports, in June 2015 the Indian government raised basic customs duties on some long and flat steel products by 2.5%, to 7.5% and 10% respectively. Additionally, anti-dumping duties of up to USD 316 per tonne on imports of single steel products from certain countries, including China, were also imposed. International iron ore prices have sharply decreased, mainly due to weaker demand from China and capacity expansions by large global mining companies in the past. However, India’s domestic iron ore prices have remained stable, reflecting the continuing short supply situation in the country despite lifting bans for mines in Karnataka and Goa. Large Indian steel players will continue to import iron ore, given the steep decline in international prices and economies of scale associated with bulk imports. However, smaller players could find it more difficult to import at large scale. Therefore, their capacity utilisation is expected to remain affected in the near term. 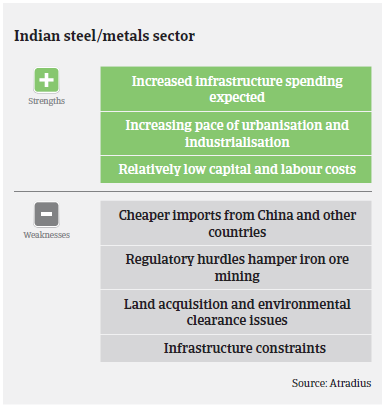 Major challenges for the Indian steel and metal industry remain land acquisition issues in setting up greenfield projects, delays in environmental clearances for mining activities, logistics support and external financing at competitive conditions. Some of the top 10 private steel producing companies currently face severe problems due to delayed implementation of their projects – caused by land acquisition and environmental clearance issues. 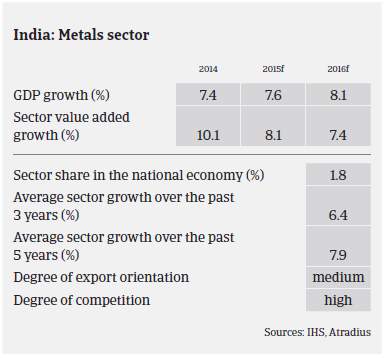 India’s steel consumption is expected to grow 7% in the fiscal year 2015-2016 on the back of increasing economic growth. At the same time, steel supply is expected to increase 10%. As a result, capacity utilisation may fall below 78%. Adding to the domestic steel industry woes the trend of rapidly increasing steel imports is expected to continue into 2016, despite the measures taken by the administration to curb them. The Indian government plans to achieve the target of 300 million tonnes of annual steel production by 2025. To reach this target, Delhi has set up the Steel Research & Technology Mission of India(SRTMI) in order to promote collaborative research programmes and to enhance competitiveness, quality, R&D and production capacities. SRTMI is being promoted as the steel industry’s contribution to the ‘Make in India’ initiative. On average, payment periods in the Indian steel/metals industry have remained unchanged since last year, taking between 60 and 90 days. 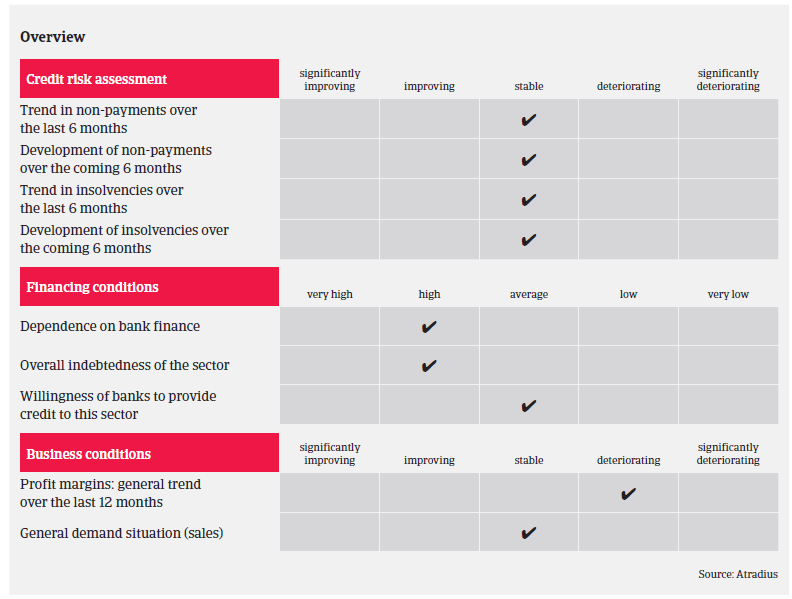 We have received just a few credit insurance claims in the last three years and, based on our experience to date, we do not plan any imminent major change in our underwriting approach as we do not expect any major increase in payment delays or insolvencies. Nevertheless, we remain prudent in underwriting this sector. To accurately assess credit limit applications we always require up-to-date financial information and, more importantly, details of up-to-date trading experience with buyers in order to assess actual requirements and monitor any changes in payment behaviour. We also assess the strength of the customer/buyer relationship.